Having dropped Lynnie at home yesterday afternoon it feels odd to wake up in the caravan with just Crosby for company. It does not take us long to get out in the woods and after a couple of miles both Crosby and I are ready for breakfast. 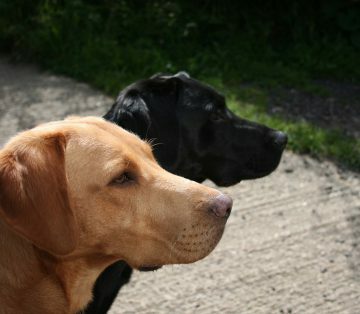 I have done many walks from Cholsey Grange, but today is unusual as I am going to be walking with my daughter, Lolly. 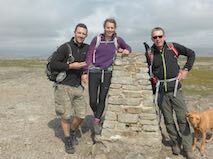 Initially I planned a thirteen-mile walk, in a few weeks time Lolly and husband to be, Toby, are taking on the National Three Peaks challenge. I envy their youth to be tackling this walk; it is not something I would take on at my age. It is set to be another scorching day, so I reign in my plans and opt for a walk of just over seven miles. 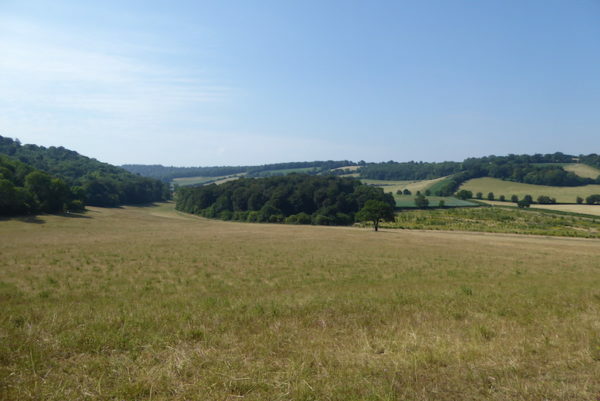 Lolly and I set off from Cholsey Grange CL up the main drive to Ibstone Common, crossing the Cricket Ground and heading diagonally until we reach the Chiltern Way footpath turning left to walk downhill through Commonhill Wood. 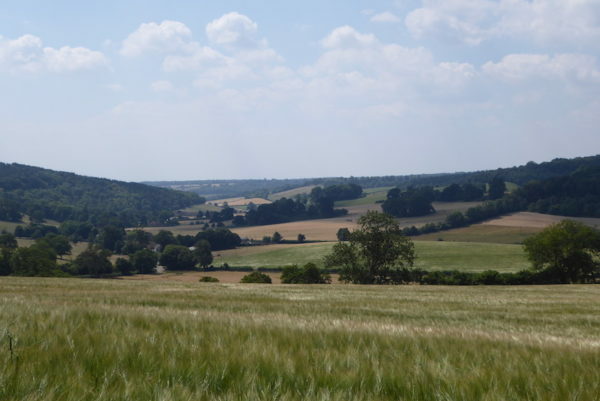 At a junction of footpaths we turn left to continue on the Chiltern Way, soon emerging from the trees we pause to enjoy the stunning view. We catch up a group of youngsters, as we pass we have a brief conversation. They are doing their Duke of Edinburgh Award and having camped overnight are on day two of their walk. As a youngster I did Duke of Edinburgh to Bronze level and should have continued. However, at the time I thought there were better ways to spend my time. Looking back I wish I had continued, but I suppose over the years I have more than made up missing the experience of a few weekends being outdoors. 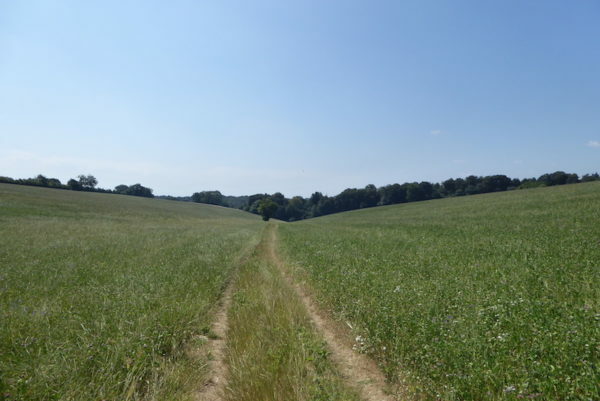 We continue on the Chiltern Way across more fields, on the way passing another couple of groups doing their Duke of Edinburgh Award. These teenagers look wearier than the first group. 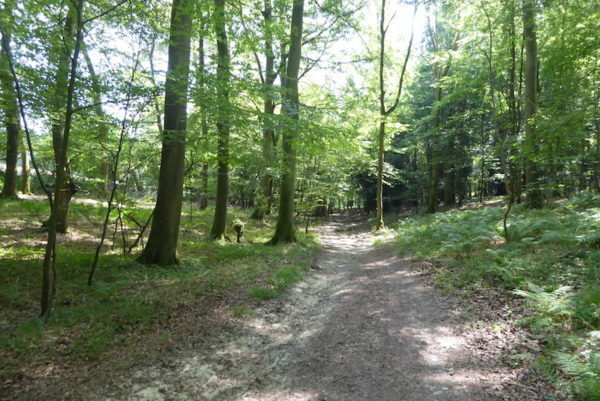 As we enter Blackmoor Wood we stay on the Chiltern Way and walk uphill towards Northend. Usually when I am walking with Lynnie I am striding uphill in front, but Lolly is fit and young so she pushes on with Crosby whilst I lag behind. We head through Northend then turn left to go through fields into woods. This is a cracking piece of woodland. At a junction of paths we turn left, leaving the Chiltern Way, to follow the footpath towards Turville Park Farm. Walking companionably along we chat away across a wide range of subjects. It is a real joy to be out with Lolly for few hours, just the two of us. It seems a long time since we have spent so much time together. 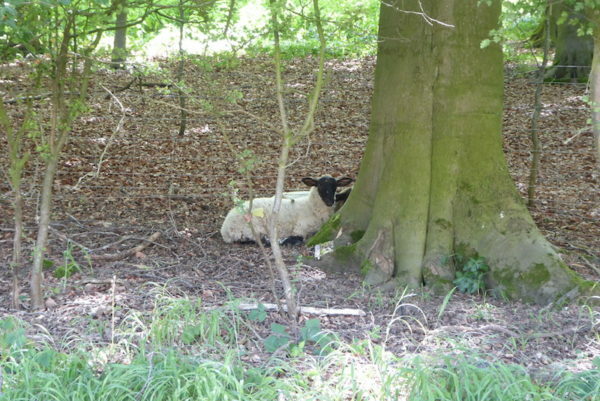 It is a warm afternoon and we spot sheep seeking a cool spot in the shade of a tree. 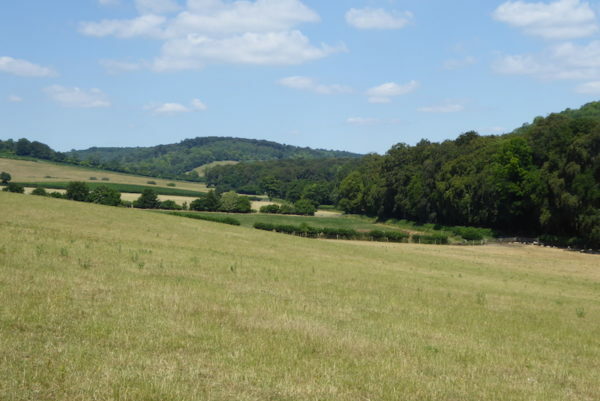 After passing Turville Park Farm we continue along the bottom of the valley until we reach a crossing of paths, here we turn left to head uphill on a track between arable fields. We remain on this track until we reach an old metal kissing gate; we go through to head across a couple of fields of pasture to reach Turville Heath. We cross the heath and contemplate stopping at the Barn Café for refreshments, but as we are not too far from our destination decide to wait until we get back to Cholsey Grange. A few days ago Lolly made a stunning chocolate cake for my birthday and we intend to polish it off when we get back. 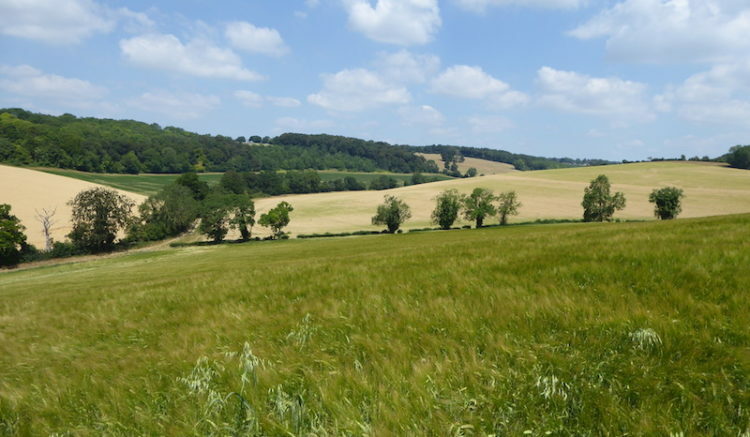 From Turville Heath we take the footpath about a hundred yards to the left of the barn. 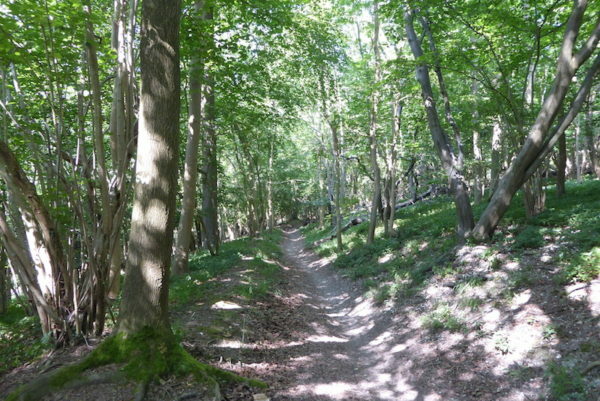 This path follows a flinty track as it descends steeply towards Holloway Lane. After crossing the tarmac road we continue on across a field of pasture and cross another lane to pass through a small section of wood to enter another arable field. This one heads steadily uphill to a stile, there are cracking views from here. Continuing on the well-defined path we reach a kissing gate and then turn left to follow the bridleway towards Ibstone. 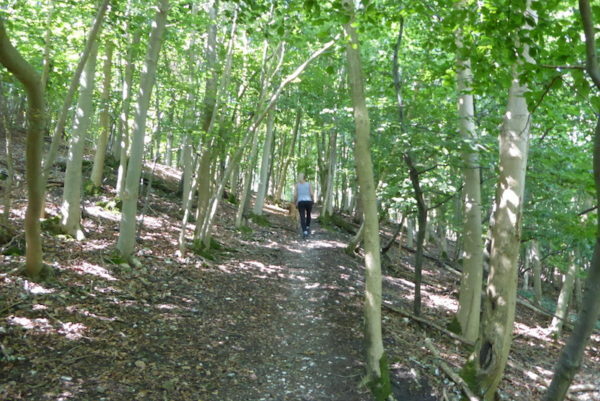 Beech trees line this track and the shade is very welcome as we complete our final ascent of the day. The path becomes a tarmac lane and continues on to Ibstone Common. From here it is the short stroll back down the driveway of Cholsey Grange CL. We have walked for just over seven miles on a hot morning, Crosby is relieved to get back and is soon sound asleep whilst Lolly and I enjoy our tea and cake. It has been a cracking walk that will live in the memory for a long time. Hopefully the short steep hills we have tackled today will help Lolly prepare for her National Three Peaks Challenge.